Happy Monday! Today I have a fun post to share with you all and a video to go with oh and some nail art as well! 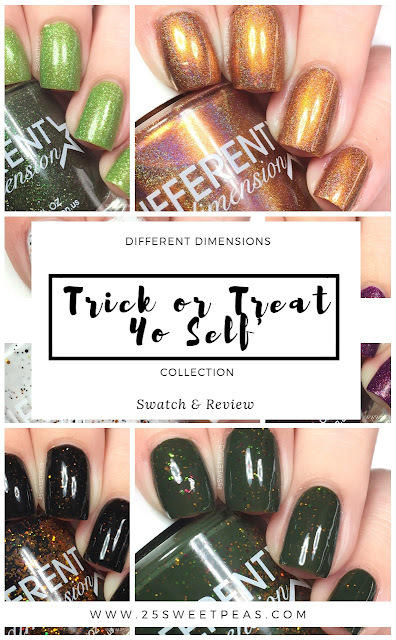 The collection in the spotlight today is a new one from Dimension Nails, this one is called Trick Or Treat Yo Self collection and it consists of 6 new polishes and some of them aren't your traditional polishes so you are going to want to check them out. So lets take a look at the photos and details because these are releasing October 5th which is right about the corner. 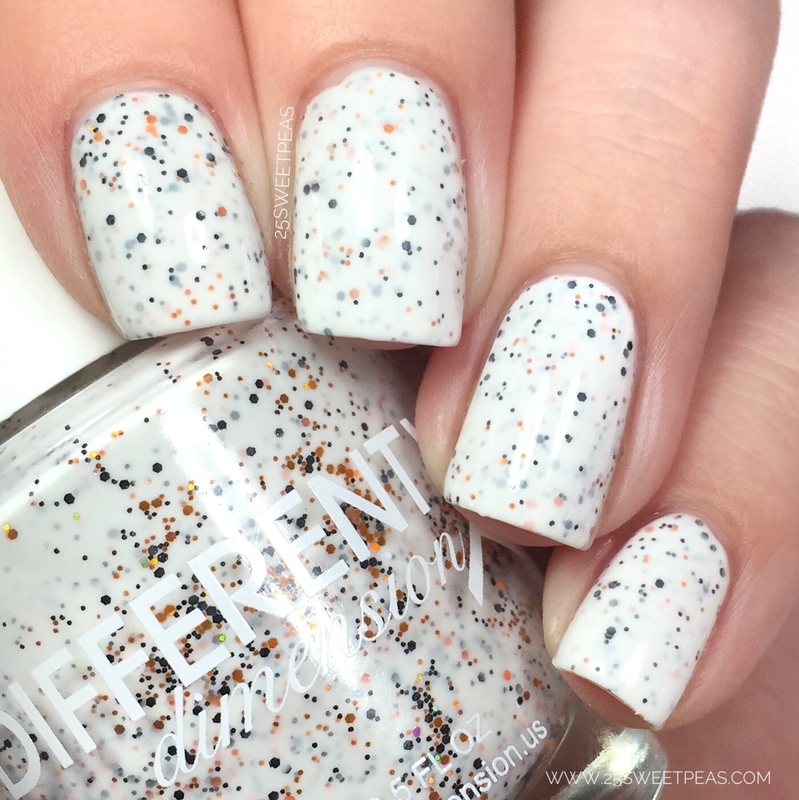 A white crelly with black and orange holographic micro glitters. 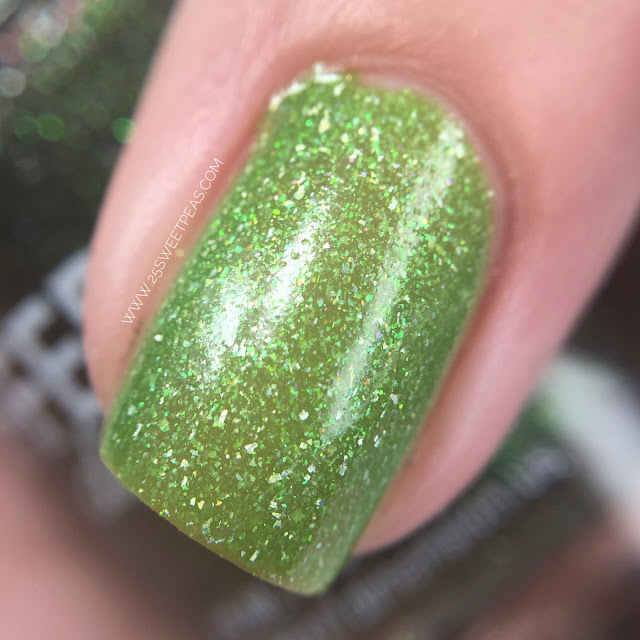 First up is a super fun crelly! 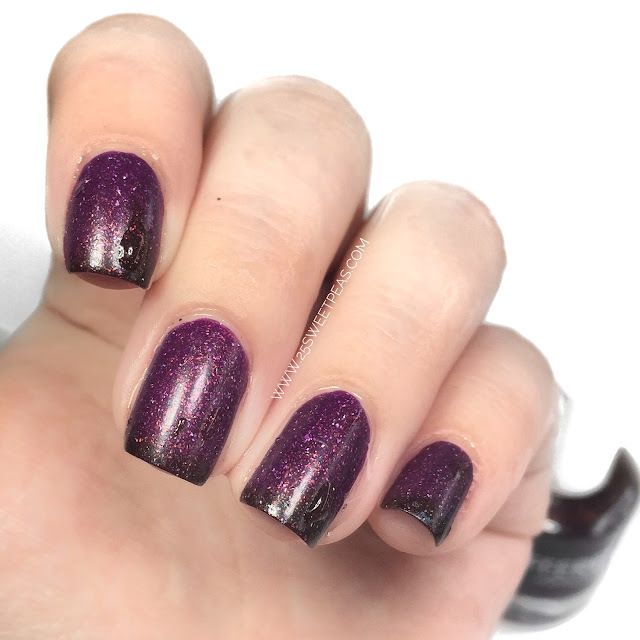 The formula on this is super easy to use and it looks really neat built up in two coats, and then just gives you the perfect Halloween look with out being over the top Halloween. The way I described this one in my video was like a Halloween Cookies N Creme, and now I can't stop thinking of it that way. Now some ice cream sound pretty good! 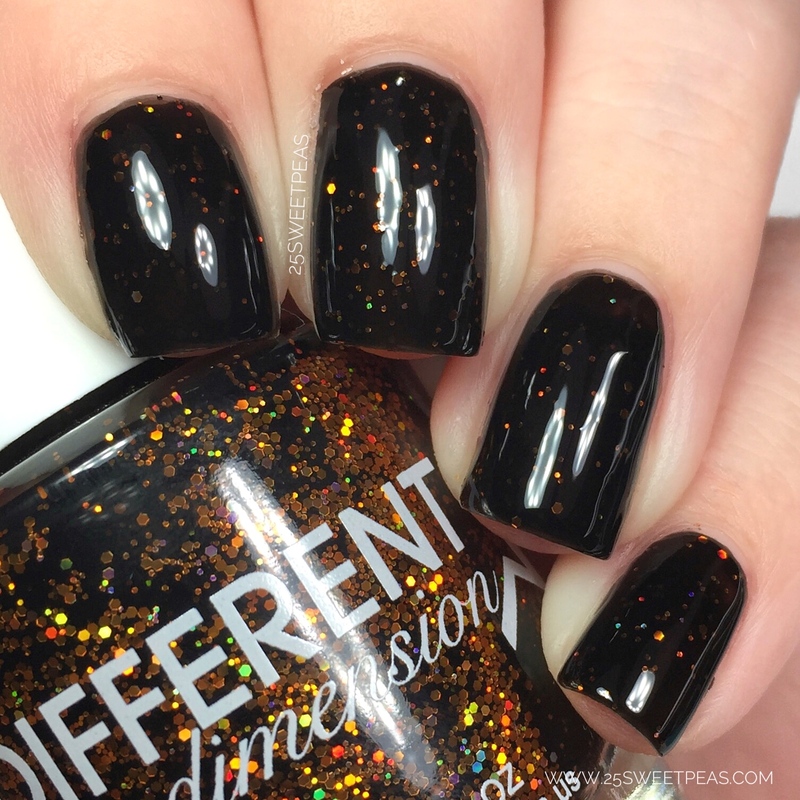 A black jelly polish with added orange holographic micro glitters. 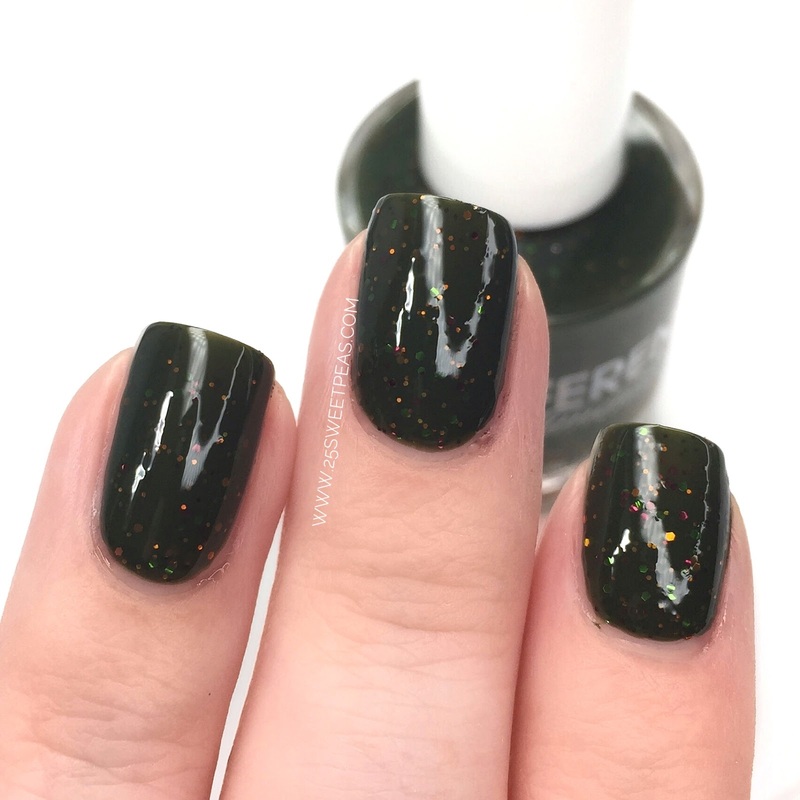 Now here with this one we get a little more Halloween vibe-y because its a black based jelly with holographic orange micro glitters. 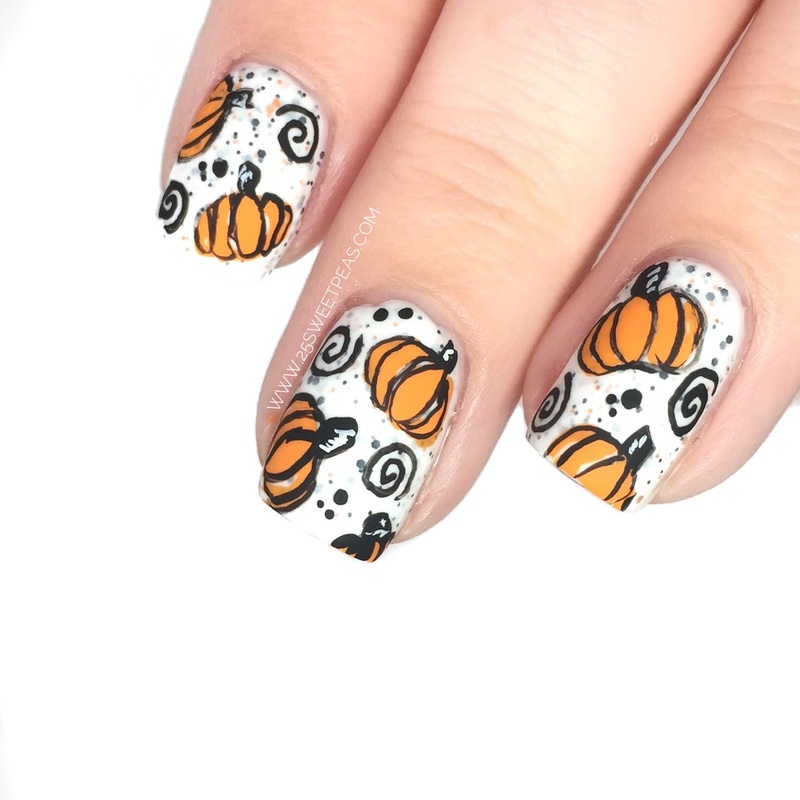 Like that is the definition of a Halloween themed polish right?! Also how fun is that name! The formula was great and applied really nice and even. Plus the glitters distributed themselves very evenly. A mossy green crelly with orange, purple and green holographic micro glitters. Love this green crelly. 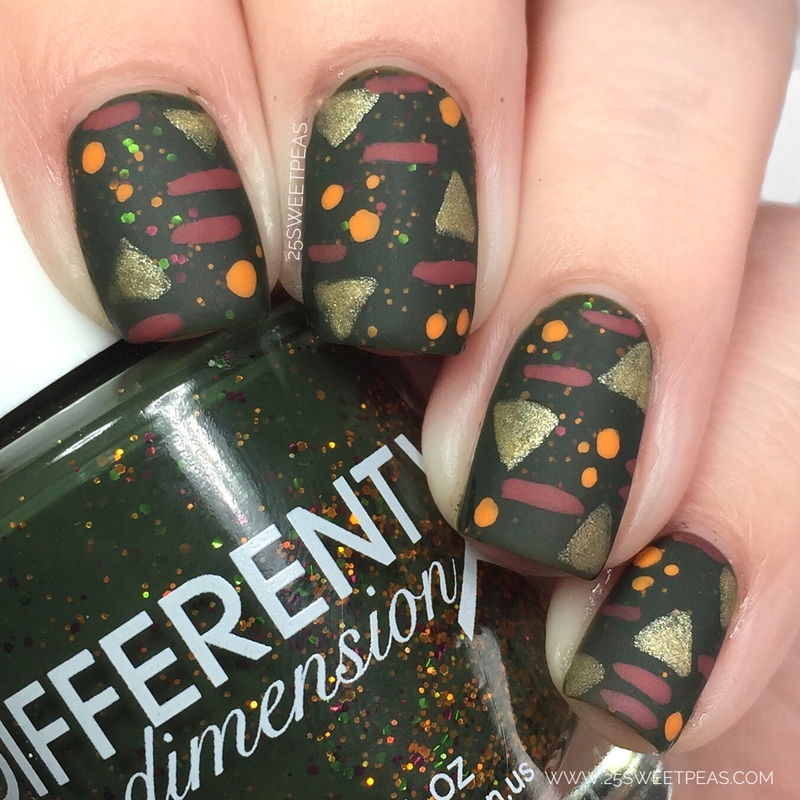 It not only good for Halloween, but I think it makes a great fall/thanksgiving polish don't you?! This one again had a really nice formula. 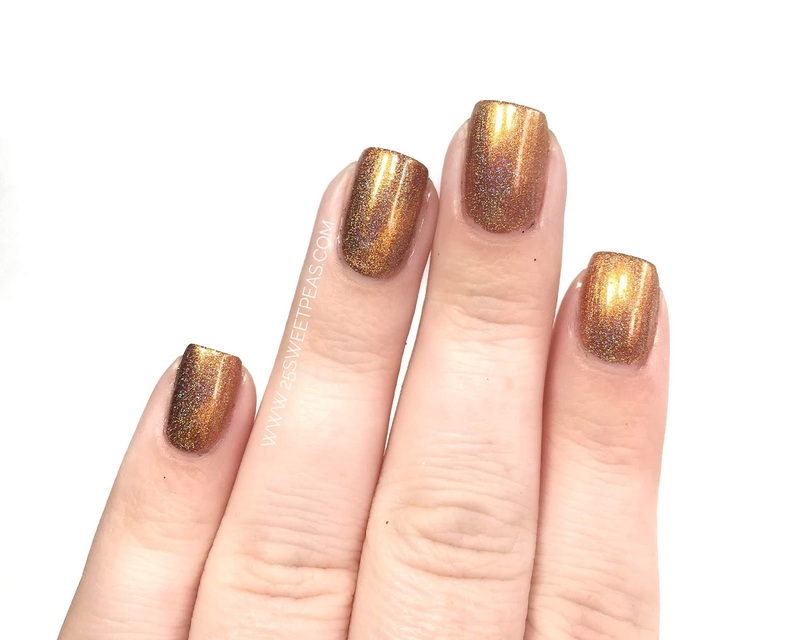 The glitter distributed themselves very evenly and they really create a neat layered look as you build up to two coats. 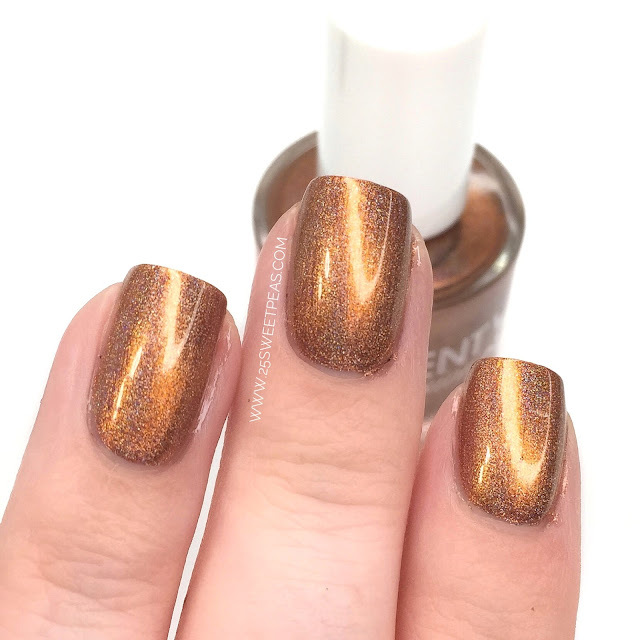 A magnetic burnt orange linear holographic polish. 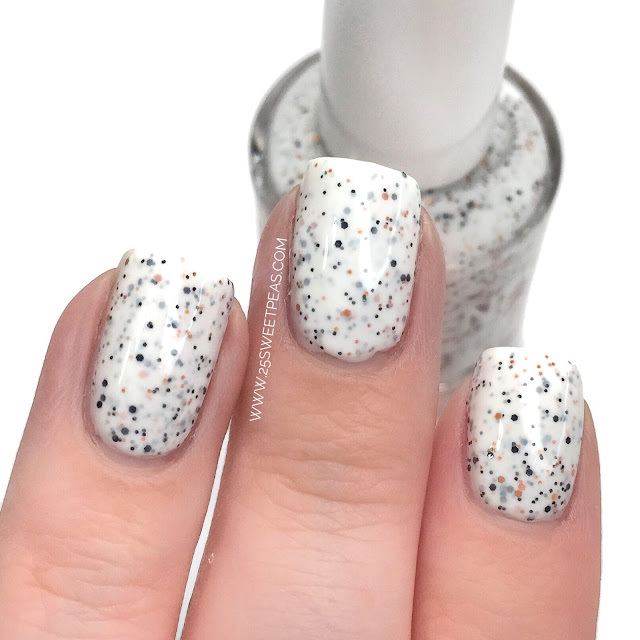 First off this polish is stunning and the formula is amazing! Now this isn't your normal holo because its a magnetic polish. 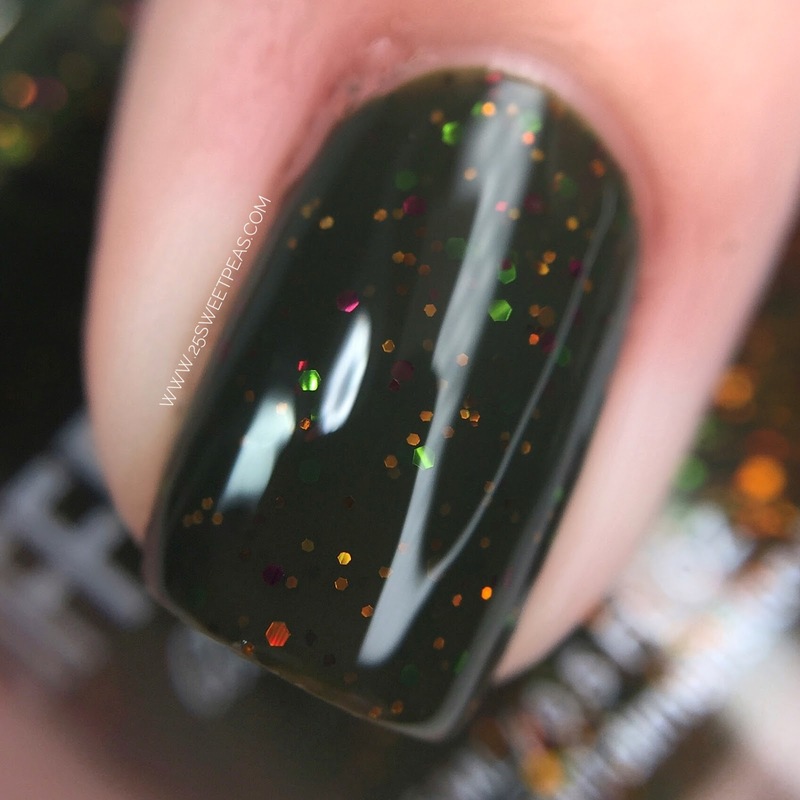 One thing to note about that though is that.... since its a lighter color the magnetic pull is a tad bit harder to see than on a darker polish. However here I think you can see it pretty well, its where more of the orange gathers. You can see it really well on my pinkie and ring finger here! 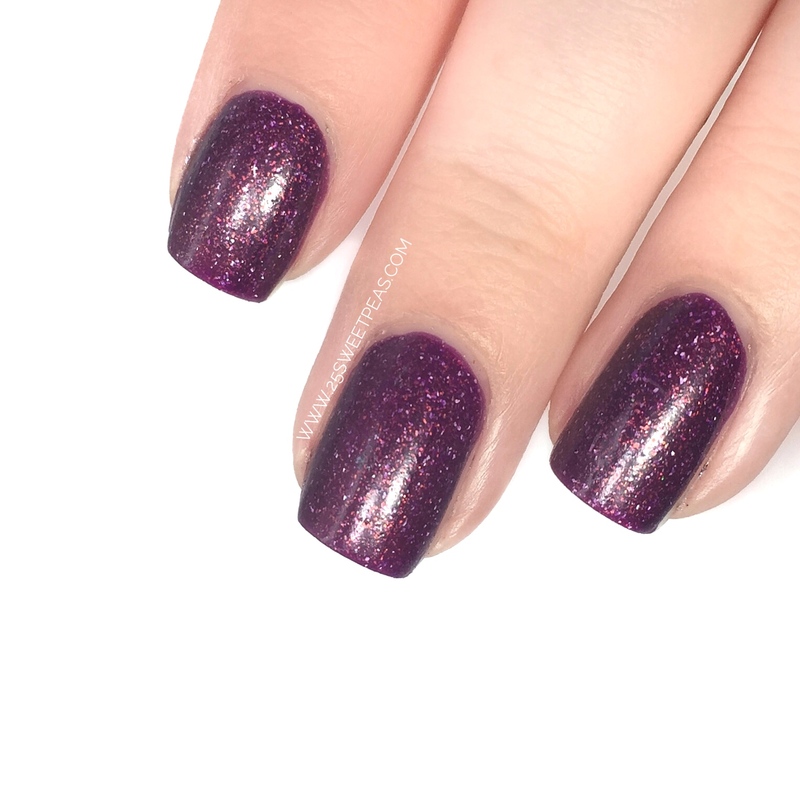 A thermal that is a grape purple when warm and then a dark plum when cold filled with aurora shimmer and holographic micro flakies. Now on to one of the thermals of the collection! 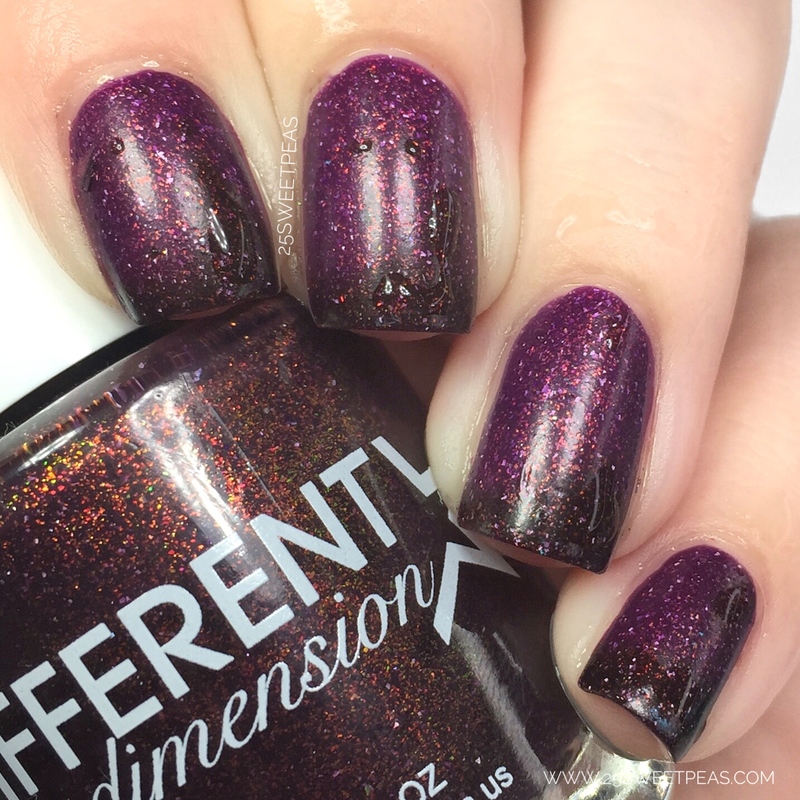 Here is a super fun purple thermal! It is a grape purple on my nails more often than not because thats it warm state which would be body temperature in this case. However if its cold it turns into a super dark eggplant purple as you can see more towards the tips of my nails. 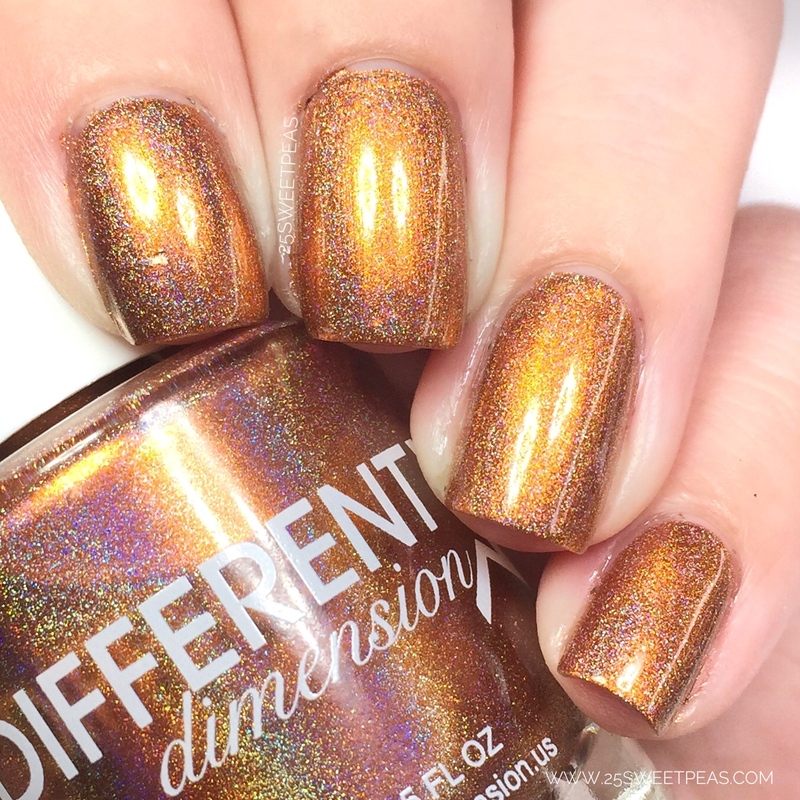 Its a really lovely polish and the formula was/is great and super nice. In this macro you can kind of see the shift happening. If you look closer to my cuticle it much more purple whereas toward the tip of my nail its much darker. 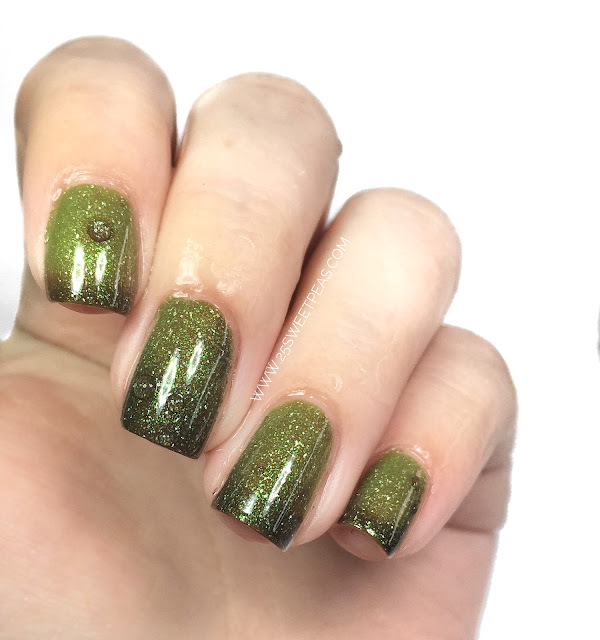 A thermal that is a lime green when warm and then a dark pine green when cold filled with aurora shimmer and holographic micro flakies. This ones shift it much stronger so it will be easy for you to see the difference. Here it reminds you of a green apple or Frankenstein while its warm. Then as it gets "cold" it turns into a pine needle green. I love the transitional photos of this one because you can see the change happening and it just looks so neat. And the bold change in color makes it all that much more fun! 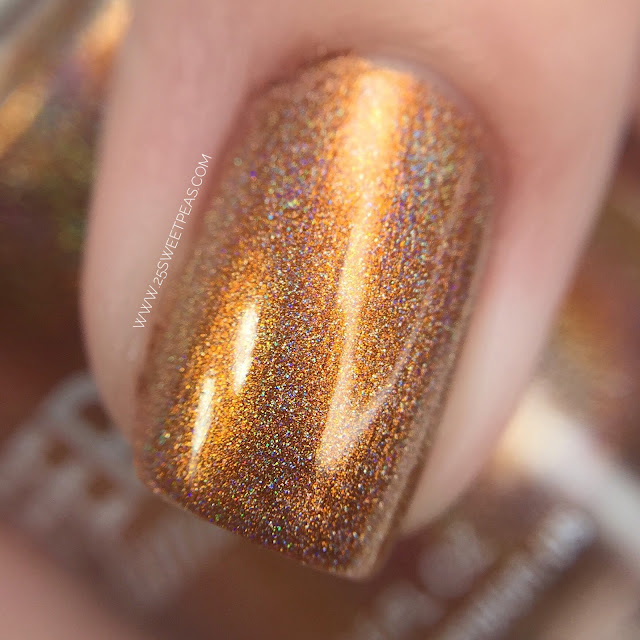 Also the shimmer on this one is really lovely as you can see and the formula is really great! 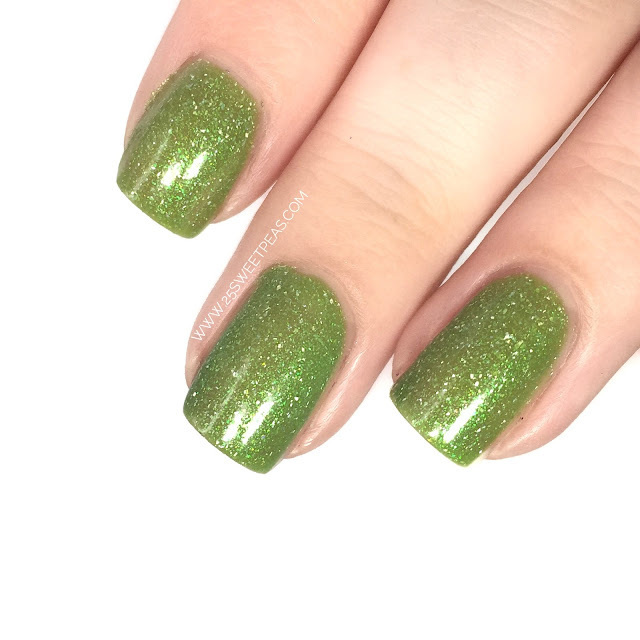 Isn't this just a lovely green? I love it! 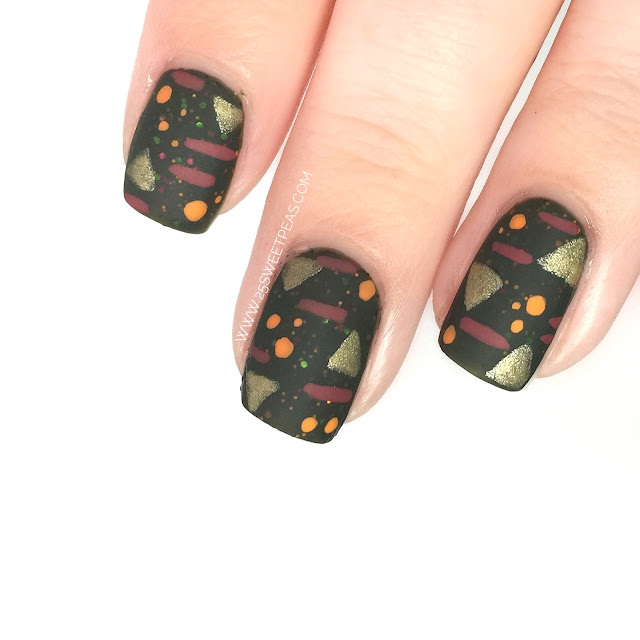 Now how about we check out some nail art! 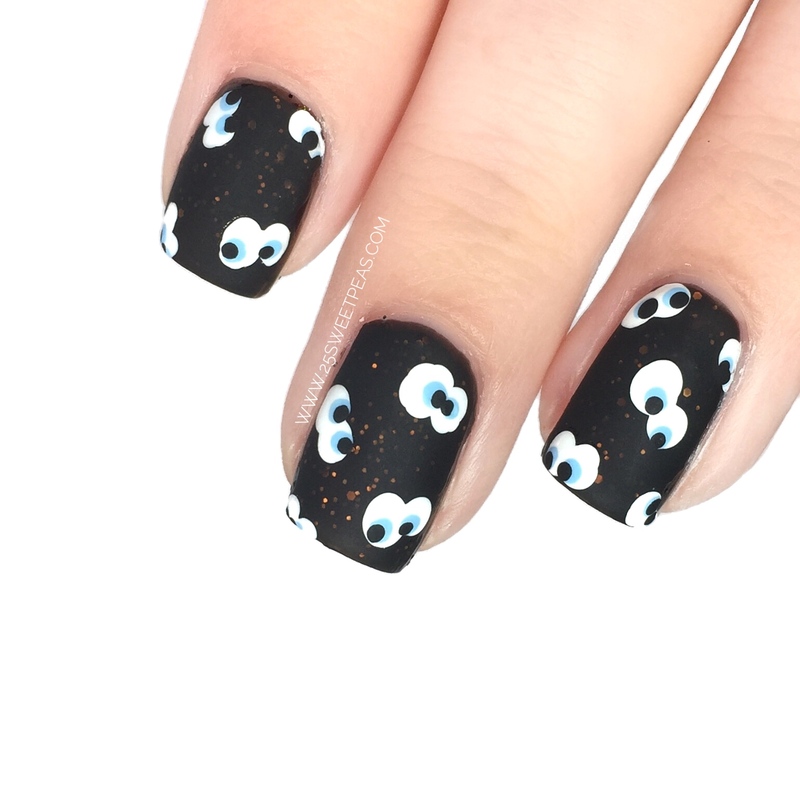 First up I decided If You've Got It Haunt It would be a neat base for some floating Halloween eyes! 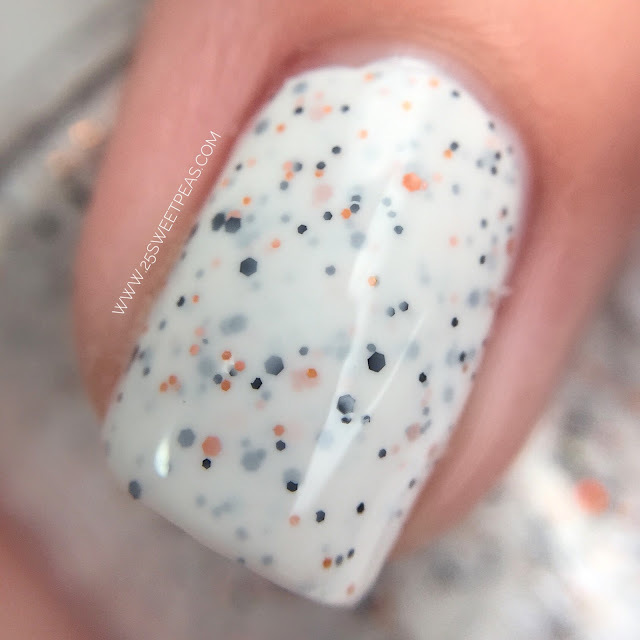 I did them with acrylic paint and then topped it with a matte top coat which made some of those orange glitters pop! Following that I dues Eat, Drink, and Be Scary as a base for some abstract fall colored art. Again this art was down with acrylic paint and then mattified. Next up and lastly art wise for today I did some whimsical sketch styled pumpkins that I really am happy with. They were intentionally not perfect to make the more free flowing and whimsical and I really like how it came out! I did them on top of BOOtiful and I really like how It came out. Again done with acrylic paint and them topped with a matte topper. 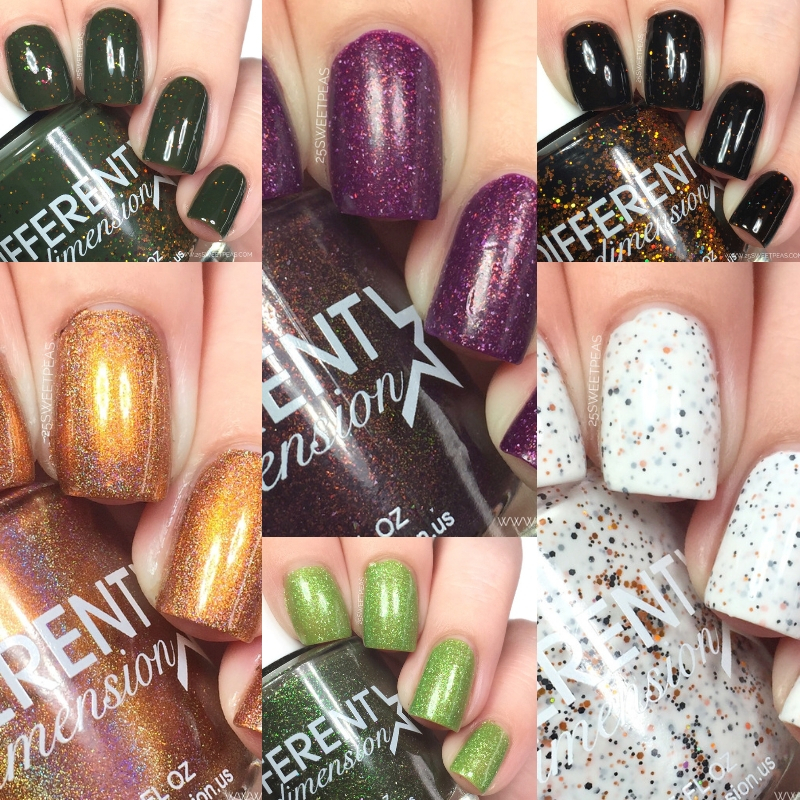 So these beauties are releasing on October 5th at 9am EDT on the Different Dimension website which is linked below! 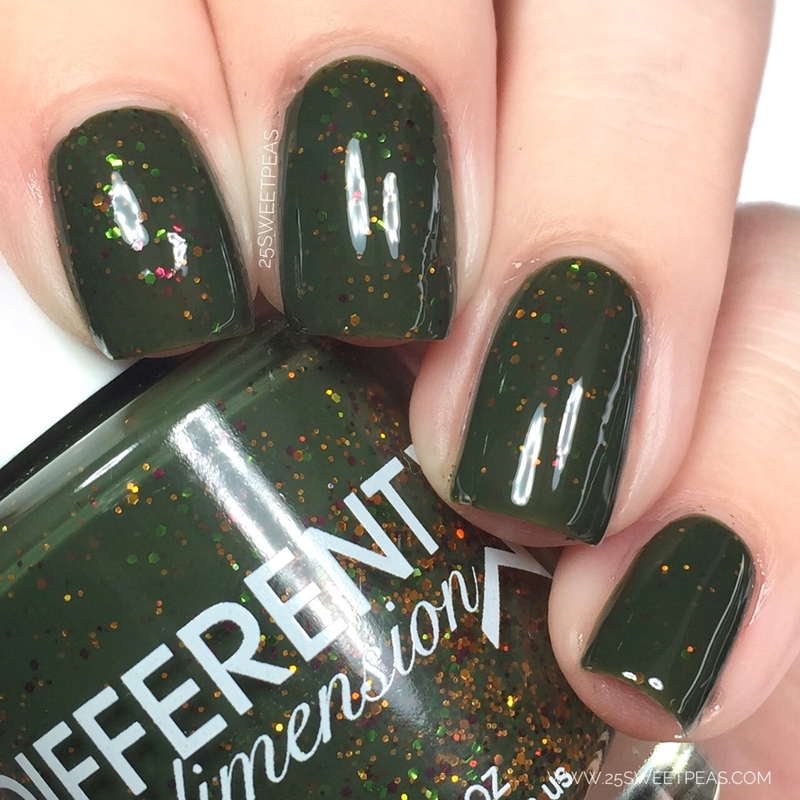 I hope you have all enjoyed this blog post and have found a polish you like! Let me know which one was your favorite! 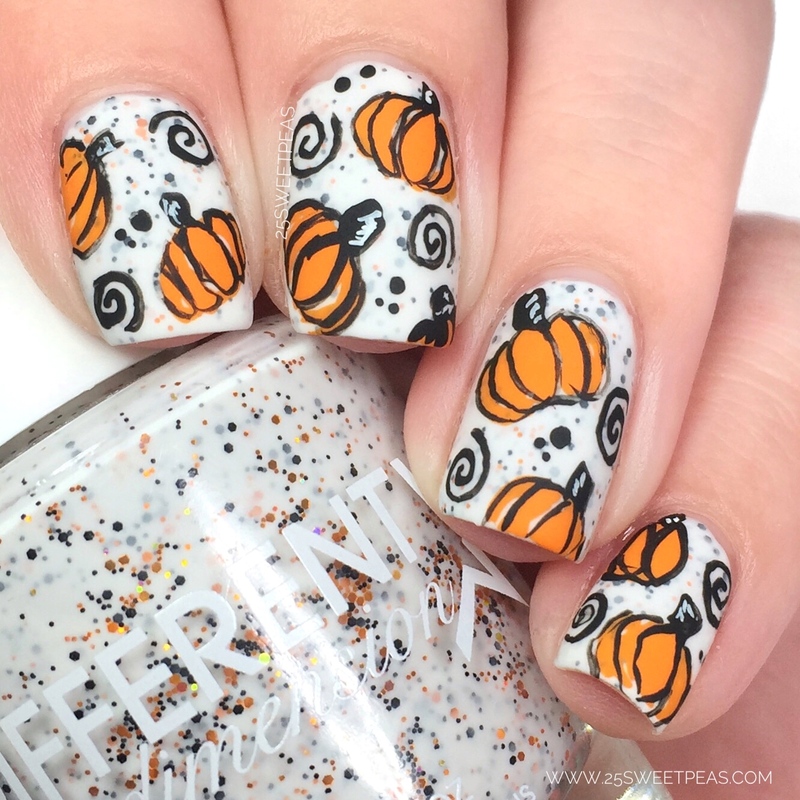 I am 100% ready for all these Halloween polishes and art! Witch Better Have My Candy is spectacular. Definitely my favorite from this collection. LOVE straight out a coffin!